Fuji Spray Guns | Hawk Research Laboratories, LLC. The Fuji M-Mode spray gun is a non-bleeder style spray gun with a rear mounted pattern control knob. This spray gun is available with a 1.3mm or 1.8mm air cap and needle set. NOTE: Not all parts for this spray gun are compatible with other Fuji spray guns. This economical spray gun is ideal for spraying primer and multicolor systems. 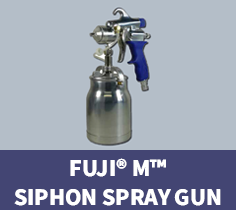 The Fuji M-Model spray gun is a non-bleeder style spray gun with a rear mounted pattern control knob. This spray gun is available with a 1.3mm air cap and needle set. 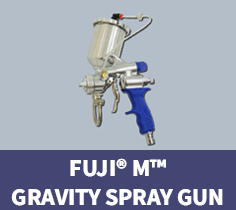 The Fuji M Gravity spray gun includes an aluminum gravity cup which is mounted on the side with a U-tube. NOTE: Not all parts for this spray gun are compatible with other Fuji spray guns. 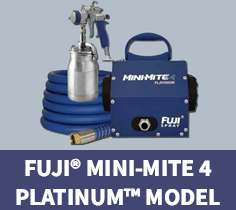 The Mini-Mite 3 PLATINUM spray system utilizes a powerful 3-stage turbine motor installed in a subcompact durable metal turbine case. This case configuration allows for ultimate portability, ease of carrying and durability. This spray gun is among the highest quality non-bleeder spray guns in the industry. It also features a side-mounted pattern control knob to allow adjustments to the spray pattern on-the-fly. 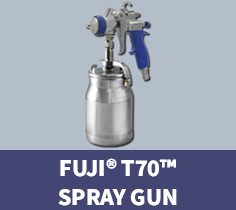 This spray gun also features stainless steel fluid components and a high-efficiency air cap for even less overspray. The Mini-Mite 3 turbine develops 6.5 PSI, which is powerful enough to spray the full line of Hawk coatings (when properly thinned), as well as StoneFlecks™ Ultra multicolor finish. 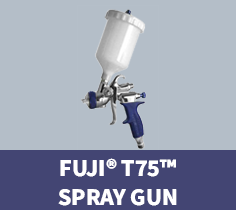 All Fuji Spray T-Model spray guns are installed with a standard 1.3mm air cap set. The Gravity T75G model is equipped with a 600cc nylon cup and the Bottom Feed T70 model is equipped with a 1-quart cup. The Mini-Mite 4 PLATINUM Model utilizes a powerful 4-stage turbine motor installed in a subcompact durable metal turbine case. This case configuration allows for ultimate portability, easy carrying and durability. 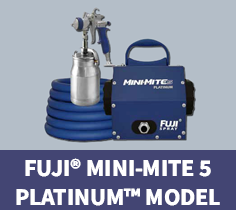 The Mini-Mite 4 PLATINUM system is recommended for those who need the extra power available – a full 9 PSI. The Mini-Mite 5 PLATINUM turbine system is the most powerful 5-stage turbine motor available. This extra power is ideal for heavier coatings under a wide variety of circumstances. 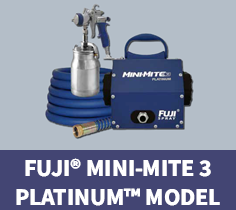 For remote pot users, the Fuji Mini-Mite 5 PLATINUM™ kicks out an amazing 9.5 PSI, which works perfectly with the 2-quart remote pressure pot assembly kit. The spray gun features a side-mounted pattern control knob, to allow adjustments to the spray pattern on-the-fly. This spray gun also features stainless steel fluid components and a high-efficiency air cap for even less overspray. Bonus Items Included: 5 for 5 (6ft Whip Hose, Wet Film Gauge, 19pc. Spray Gun Cleaning Kit, Extra Turbine Filters, and “Always Measure” Booklet to record your material preparation and results) All Fuji Spray T-Model spray guns are installed with a standard 1.3mm air cap set. The Gravity T75G model is equipped with a 600cc nylon cup and the Bottom Feed T70 model is equipped with a 1-quart cup.